Something I noticed after reading this book is that the best reviews come from where instead of picking up a book with the intention of reviewing, but where you get through a book and you find that you loved it so much for so many reasons that you just have to tell everyone! Everything That Makes You by Moriah McStay, published by Katherine Tegen Books (a HarperCollins imprint) was not what I expected it to be, and the fact that it took me by surprise is one of the main reasons I adore it so much and am so happy that I chose to purchase it back in May. When I was visiting the Chapters bookstore near my new campus for the first time, I was torn between two young-adult titles, this one and another hard cover with a cover that reminded me of a movie poster. What ultimately made me choose this book was the draw of alternating perspectives. The story goes like this: Fiona Doyle was in an accident when she was 5 which scarred the right-half of her face. She's quiet and highly self-conscious about her appearance and it effects her quality of life in various ways; she's in love with the top jock Trent McKinnon from afar and she's petrified of singing her original songs in public at the open mic night hosted at her favorite coffee shop. The second perspective that takes over every other chapter belongs to Fi Doyle. No accident, no scars. She's the top lacrosse player in memphis, but after experiencing a debilitating injury early in the season, she's faced with losing the one thing that defines her. Fi also has some other tragic occurrences to face along the way . . . This book deals with the ultimate question: What if? What would life be like for Fiona if her face hadn't been scarred all those years ago? This novel demonstrates how fragile things like fate and circumstances can be when an entire life can be uprooted by one single course of events. McStay also shows us that even if we don't have the power to control the storm, there is always a way to learn how to weather it, and in the end you'll come out alright. 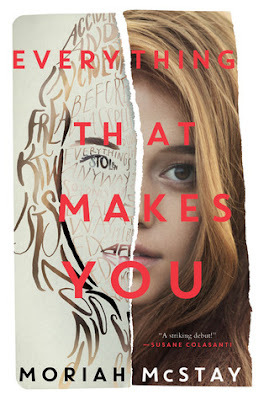 For a debut novel, Everything That Makes You is spectacular; beautifully written, gripping and full of both predictable and unpredictable twists, you'll be more than satisfied if you choose to pick up this book for yourself, even while it's still in hardcover. While this may only relate to people who are interested in the publishing industry - or typography - but I found something in this book that caught my attention that I felt was worth pointing out, especially since it fit in perfectly with the alternating perspectives that make up this book. Anyone that has read a book where the perspective switches once or multiple times per chapter will be aware of a few differences between these and books that incase one single narrator/perspective. The biggest difference is usually that there is a change in font. 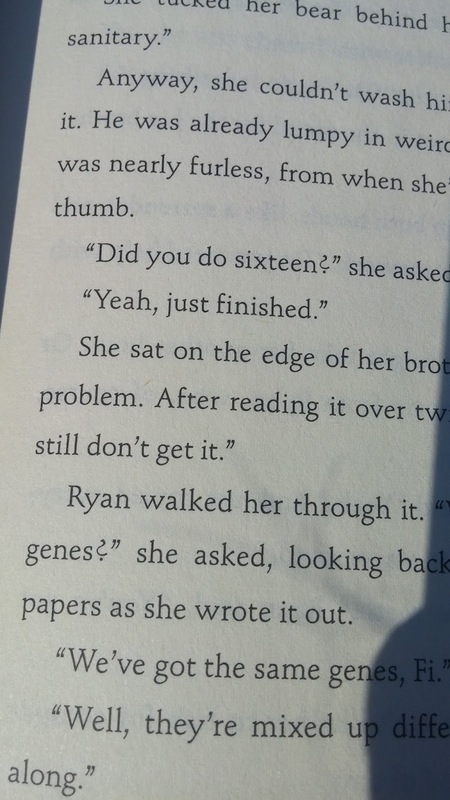 This is something I noticed when I read Flipped for the first time in 7th grade (still one of my childhood favorites :) ). It's a common convention among these types of works, since it gives the reader a visual cue that somebody else is now telling the story. Anyway, before I sound too nerdy, here's what I noticed that's special about Everything That Makes You. And for the record, this is just a theory; it could just be an odd styling of the font they chose for Fi's perspective and they decided to just go with it because it seemed fitting. 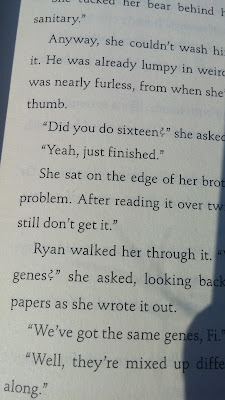 I took this picture of a page in one of Fi's chapters, and what I found interesting were the question marks. You can see two of them in the photo, next to "genes?'" and "'Did you do sixteen?'" The question mark's actually flipped upside down. At first I thought that it was just somebody using the upside-down Spanish question mark (yay, 10th grade Spanish made an impression on me! ), but when I looked it up (had to Google it - turns out I didn't remember after all), the dot flips with the rest of the punctuation instead of staying at the bottom. To me, that's proof that this was a stylistic typographical choice that somebody made during the production process of this book. In my mind, it's a really clever choice, even if it's not something every single reader is bound to catch. I'd love to find out who came up with the idea, whether it was something the author had imagined or if it was something a member of the editorial team conjured up, or if the idea lived solely within the minds of production. Either way, it's a little thing that makes an already unique book somehow more prominent, and it's something that has certainly left an impression on me. 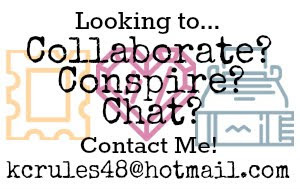 That little upside-down question mark goes to show how every facet of the publishing industry - marketing and sales, editorial, agenting, even typesetting - has a creative aspect to it, and you don't have to be a writer in order to enjoy a surplus of creative energy and ideas.